Prior to the North German Confederation, German States stamps, were issued by most of the separate Germanic kingdoms, duchies, free-cities, etc. of Northern Europe. Prussia, or Preußen, in German, was a German Kingdom from 1701 to 1918 and a Constitutional Monarchy from 1848 to 1918. Though there were independent kingdoms and duchies within its borders, Prussia comprised almost all of the North German Confederation and about 2/3 of the total area of the German Empire in 1871. Being the largest and most dominant of the German kingdoms, the King of Prussia became the German Emperor, when the German Empire was formed in 1871. 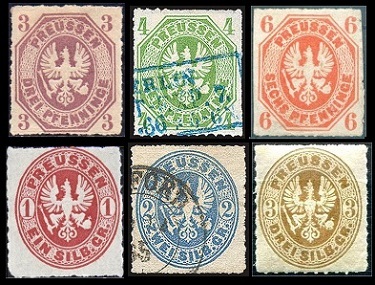 The five German states stamps for the Kingdom of Prussia shown above were issued between 1850 and 1856. 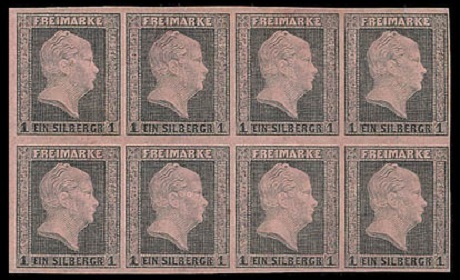 These first Prussian stamps were engraved on paper with a laurel wreath watermark, and they were imperforate. The background behind the portrait consists of crossed lines. These postage stamps featured a right-facing portrait of King Friedrich Wilhelm IV of Prussia (Lived: 1795-1861, Reigned: 1840-1861). 01 Sgr. (1850 - Mi. #2, Sc. #3) - Black on Rose, Black on Bright Red. 02 Sgr. (1850 - Mi. #3, Sc. #4) - Black on Blue. 03 Sgr. (1850 - Mi. #4, Sc. #5) - Black on Yellow, Black on Yellow Buff. 04 Pf. (1856 - Mi. #5, Sc. #1) - Yellow Green, Dark Green. 06 Pf. (1851 - Mi. #1, Sc. #2) - Red Orange. 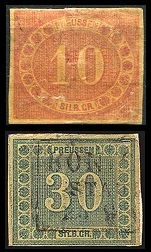 The three German states stamps for the Kingdom of Prussia shown above were issued during April 1857. These new Prussian stamps were typographed on unwatermarked paper, and they were imperforate. The background behind the portrait is solid. 01 Sgr. (1857 - Mi. #6, Sc. #6) - Rose, Carmine Rose. 02 Sgr. (1850 - Mi. #7, Sc. #7) - Blue, Dark Blue. 03 Sgr. (1850 - Mi. #8, Sc. #8) - Orange, Yellow. 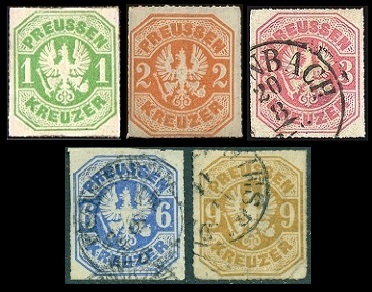 The four German states stamps for the Kingdom of Prussia shown above were issued during 1858 and 1859. These new Prussian stamps were typographed on unwatermarked paper, and they were imperforate. The background behind the portrait consists of crossed lines. 04 Pf. (1858 - Mi. #9, Sc. #9) - Green. 01 Sgr. (1858 - Mi. #10, Sc. #11) - Rose. 02 Sgr. (1858 - Mi. #11, Sc. #12) - Blue, Dark Blue. 03 Sgr. (1859 - Mi. #12, Sc. #13) - Orange, Yellow. 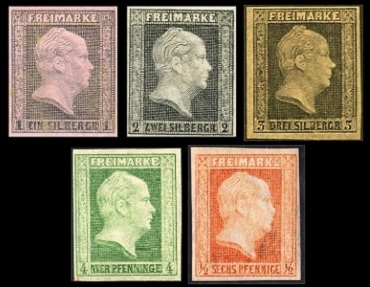 The six new definitive stamps of Prussia shown above were issued between 1861 and 1865. These new stamps were embossed, with the Prussian coat-of-arms, and they were rough-rouletted 11 1/2. The rouletting however, was very poorly done, and stamps that have full rouletting all the way around demand substantial premiums. There are many shades and varieties on this issue. Please see the Michel specialized catalog for details. 03 Pf. (1865 - Mi. #19, Sc. #14) - Red Violet, Red Lilac. 04 Pf. (1861 - Mi. #14, Sc. #15) - Yellow Green, Green. 06 Pf. (1861 - Mi. #15, Sc. #16) - Orange, Vermilion. 01 Sgr. (1861 - Mi. #16, Sc. #17) - Rose. 02 Sgr. (1862 - Mi. #17, Sc. #18) - Ultramarine, Blue. 03 Sgr. (1862 - Mi. #18, Sc. #20) - Bister, Gray Brown. The five new definitive German states stamps of Prussia shown above were issued on July 1, 1867. These re-designed stamps were embossed, with the Prussian coat-of-arms, and they were rough-rouletted 16. They are usually very poorly rouletted, as is the case with the previous 1861-1865 embossed postage stamp issues. 01 Kr. (1867 - Mi. #22, Sc. #23) - Green. 02 Kr. (1867 - Mi. #23, Sc. #24) - Orange. 03 Kr. (1867 - Mi. #24, Sc. #25) - Rose. 06 Kr. (1867 - Mi. #25, Sc. #26) - Ultramarine. 09 Kr. (1867 - Mi. #26, Sc. #27) - Bister Brown. In 1868, the German states stamps of the Kingdom of Prussia were replaced by those of the North German Confederation. The 06 Pf. denomination stamp shown above (Mi. #10, Sc. #10) was issued during November 1859. It is engraved on unwatermarked paper. These stamps were printed from the same plate used to print Mi. #1 during 1851. The background behind the portrait consists of crossed lines. The two high-denomination definitive stamps shown above were issued in 1866. To prevent their re-use, they were typographed in reverse on paper resembling goldbeater's skin , and they are rouletted 10. Most examples, whether mint or used, have a very bad appearance and are in very poor condition.